I always wanted to try a recipe like this. 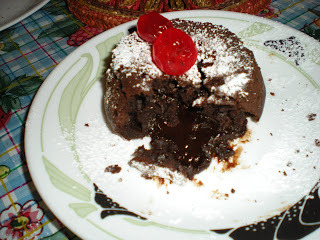 The first time I made it at my friend's place, it turned out to be a brownie. I did a second time, now, at my own place. Success!!! Don't put too much margarine or butter and beat eggs until completely pale, these might be the reason for my first unsuccessful attempt. 1. Oil slightly the ramekins. 2. In bowl, mix egg, egg yolk and sugar, until mixture is pale and form ribbons. 3. Chop chocolate with serrated knife. 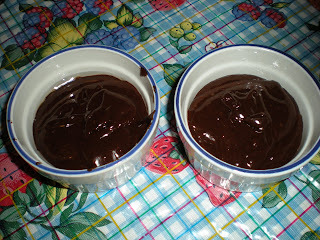 In a heatproof bowl, melt margarine and chocolate over simmering water. 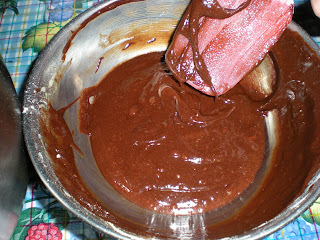 Remove from heat and add egg mixture. Incorporate flour by sifting and mix with a rubber spatula. 4. 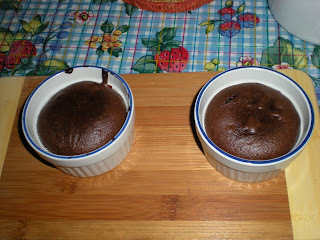 Portion into ramekins. Chill for at least 1 1/2 hour. 5. Preheat oven to 450F. Bake for exactly 8 mins if straight out from fridge. 6 mins if cool at Room Temperature. 6. Let it rest for a 2-3 mins. Use a running knife to remove cake from the edge. Turn upside-down.